Important Note: Please note that the length of the 0.965" nosepiece, as listed below, is 15mm (0.59"). Before purchase, please make sure that the thumbscrew on your telescope is within this distance from the rear end of your focuser drawtube. Otherwise, the thumbscrew will not be able to engage and lock the diagonal. This is a known issue with some vintage telescopes in which the locking thumbscrew on the telescope is recessed by more than 0.6", and this diagonal will not work for you. Disappointed by the lack of quality 0.965" eyepieces for your vintage telescope? Missing a diagonal for that small telescope you picked up in a garage sale? Wish you could use wider angle 1.25" eyepieces with your small spotting scope? Here's the solution you need! Many vintage telescopes sold up to the 1960s, cheap introductory telescopes sold today, and many spotting scopes use a smaller, older, almost obsolete 0.965" diameter format for diagonals and eyepieces. Having a 0.965" barrel severely limits the number of eyepieces and accessories you can buy and use in the after-market. 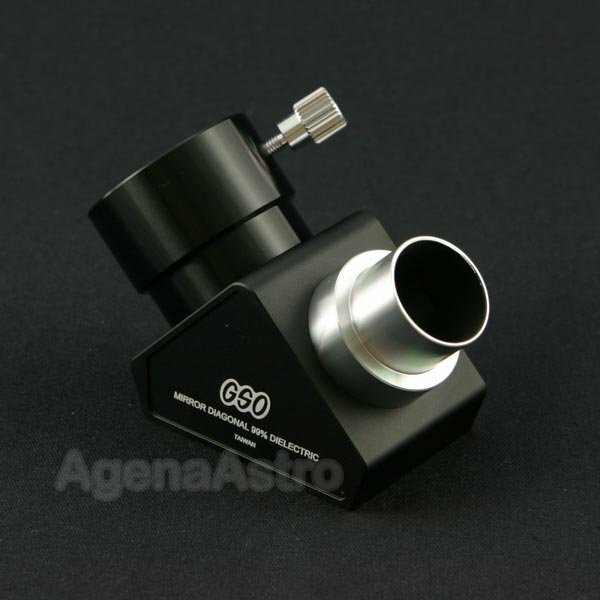 This popular hybrid diagonal from GSO allows 1.25" eyepieces, diagonals, and other accessories to be used in 0.965" focusers, and at once allows hundreds of more common 1.25" format astronomy items to be used with your telescope. GSO's hybrid 0.965"-1.25" 90-degree dielectric mirror diagonal continues their tradition of offering superb products at excellent prices. This beautifuldiagonal features a BK7 mirror that is precision ground to a flatness of 1/10th wave (minimum) and features dielectric 6-layer enhanced silver coatings with an over-coat protective layer for a light efficiency of over 99% reflectivity across the entire visual spectrum. The mechanics of this diagonal are also top-notch. The robust aluminum body and attachment barrels are precision CNC machined to strict tolerances from solid stock throughout. The 1.25" eyepiece holder features a brass compression ring to protect your eyepieces and accessories. It also includes an internal safety stop to prevent long barrels on some eyepieces and barlows from hitting the diagonal mirror. The diagonal sports a handsome anodized finish. The combined result is a superb diagonal offering excellent mechanical and optical quality at a great price. Dielectric coatings are more durable than regular or enhanced aluminum coatings, so you will enjoy years of excellent performance from this product. A unique feature of this hybrid diagonal is the use of a dual step 0.965"/1.25" chrome barrel on the telescope end. While designed primarily for use with 0.965" focusers, the step barrel also allows you to use this diagonal in 1.25" focusers (although your field of view might vignette in some situations if used in this manner). Total length of the nosepiece is 25mm (0.98"); length of 1.25" portion of nosepiece = 10mm (0.39"); length of 0.965" portion of nosepiece = 15mm (0.59"). The diagonal comes in a nice foam-fitted storage box. Weight: 6.1oz; 2 end caps included. Made in Taiwan. Please Note: This diagonal can only be used with refractor telescopes and some catadioptric telescopes like Schmidt-Cassegrain, Maksutov-Cassegrain, etc. It not meant for use with Newtonian / Dobsonian reflector telescopes or other variants of Newtonian telescopes. Review by Fabrice Descharles of French.